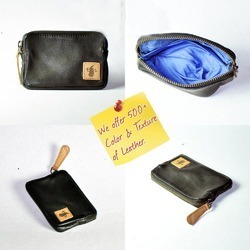 Providing you the best range of leather carry on pouch - leather waist pouch, buffalo leather desk utility tray, genuine leather tissue holder - car sun visor tissue holder, genuine leather passport holders - passport cover, genuine leather two tone bi fold designer men's wallets and genuine leather designer wire managers corporate gifts- accessories with effective & timely delivery. 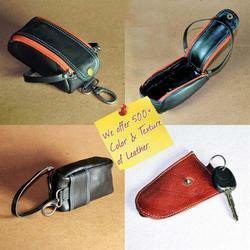 Owing to our expertise, we have been able to offer our clients impeccable quality Leather Carry On Pouch. Known for its wear and tear resistant nature, these products are designed as per the set market norms by our experts using high quality leather and ultramodern techniques. We offer our products in varied designs & finishes as per the need of customers. 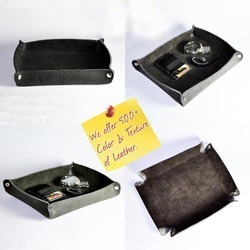 Backed by rich industry experience and knowledge, we are engaged in offering Buffalo Leather Desk Utility Tray. Our offered utility tray is design using premium quality genuine leather keeping in mind the market trends. This utility tray can be made in your own design or pattern. In addition, we are benefiting our customers by providing this utility tray as per their needs. 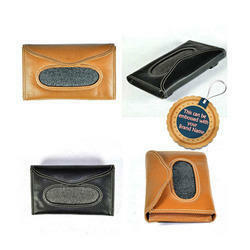 With our in-depth knowledge and experience, we are engaged in offering a wide array of Leather Tissue Holder. The provided tissue holders are checked before delivering to customers in order to ensure its flawlessness. 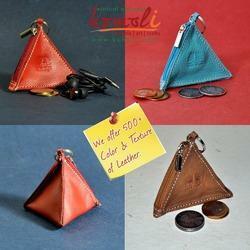 These tissue holders are designed by our craftsmen with top class leather and advanced techniques. Provided tissue holders are available from us in customized options as per the market preferences. 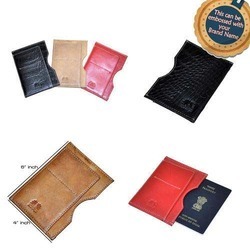 Backed by the team of skilled professionals, we are offering a quality assured array of Leather Passport Holders. The Leather Passport Holders we offer is available in various sizes. These products are known for their wear and tear resistant nature. 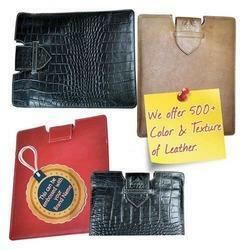 Being pioneers of the industry, we are offering a quality assured array of Leather Wire Managers. 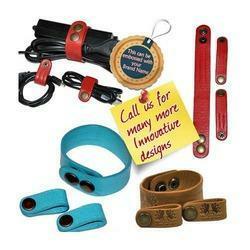 The Leather Wire Managers we offer known for their precise use. Besides, these products are suitable to meet the applications of various industries. Moreover, one can get these products at reasonable rates. 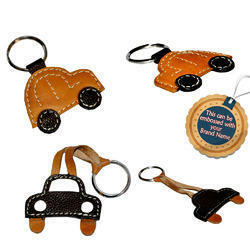 These Genuine Leather Customized Key Rings / Chains have been skillfully made by our Artisans providing you the most appropriate quality work along with the best grade leather. We being pioneer in the industry have developed significant skillsets in-house to cater to any requirement that our customers desires to have. We offer more than 500 Color, Textures and Type of leather to choose from and hence its always been an for the customers to return back to us all the time. Its indeed a most appropriate & very economical Corporate Souvenir & Corporate Gift. 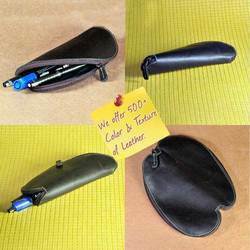 Look for your own design and style along with the color and Leather Pattern. Incase, you need some designing help, our designers would help you in that as well. We provide an end to end solution. These Key Rings / Key Chains would give you the right enrichment to your brand. Customized Services from Komoli Craft. Something impressive for your most precious and valued gadget. A slip-in Genuine Leather envelop type sleeve for your IPad. Contemporary and Stylish design with magnetic positioning lock on the top makes it look remarkable. 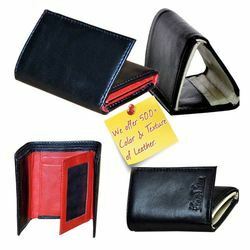 Its made up of high quality genuine leather produced in India. The finishing is indeed remarkable and absolutely an example of master craftsmanship. The contrast stitching is giving it a distinct look. The internal lining is made of smooth satin with padding between the leather sued and the lining. This ensures that there is no scratch mark coming on the gadget while you slide it inside or take it out. The open section of the envelop shaped cover has ergonomically designed cut to ensure that you can hold the IPad properly while operating it with the cover. The flap over magnetic lock holds it well and it has a loop lock as well which ensures that even accidently the IPad doesn’t move out easily out of the cover. The handpicked leather ensures that you get the best of the available lots. The silky smooth grain finish makes it look rich and the quality of the leather is our guarantee. The IPad cover comes with a guarantee of 6 months against any kind of manufacturing defect. We have the confidence in our product. Incase, you are looking for bulk quantity of this product under your brand or wish to use this as your corporate souvenir for corporate gifting purpose, we can have it branded / corporate logo embossed on this for you. You will have the freedom to choose the size or shape and choose from more than 500 colors and texture of Genuine Leather.